90s Kids nostalgia! A look back at what the final decade of the 20th century contributed to the anime phenomenon. 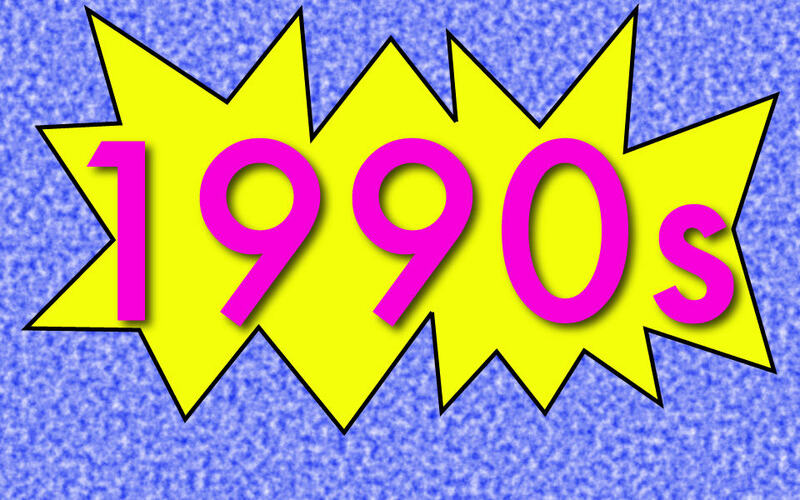 Shall we talk about the 90’s? I promise it won’t be hard. This is the decade when some of the really basic concepts emerged, concepts that are with us still. To an American, Mobile Suit Gundam appears not so much in the ’90’s as wrapped around them. It debuted in 1979, and the first English translation didn’t make its way over here until 2001. 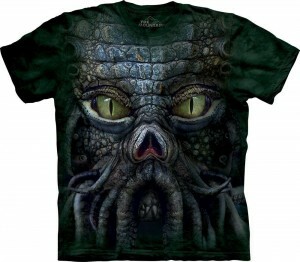 But it was hugely popular all over Asia. Throughout the ’80’s, it was re-released as compilation films, and by the ’90’s, new series—Mobile Fighter G Gundam (’94-’95), Mobile Suit Gundam Wing (’95-’96), Mobile Suit Gundam: The 08th MS Team (’96-’99)—were appearing. Watching them now, you can see (if you care to look) all the period earmarks of tone and style. It was not that the Mobile Suit itself was new—it was taken from Robert Heinlein’s Starship Troopers . 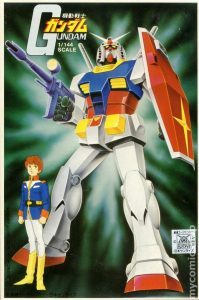 Also, prior to Mobile Suit Gundam there were plenty of stories of giant robots, even giant robots with operators inside. However these were aimed at children, who almost always like to imagine having a big strong friend and protector. Mobile Suit Gundam was revolutionary in that it was NOT intended for children. It was intended as a damning indictment of war. The first draft was extremely dark in tone, with the tragic death of a main character and a dangerous alliance that turned bad. This dark tone was retained in the novels. The finished production was considerably lighter, but it was still very serious and occasionally violent. Even in the US, Mobile Suit Gundam and its descendants eventually took over the airwaves, and almost immediately collided with the basic trope of Boy Pilots. Boy Pilots are usually far more cheerful than Gundam, and rarely anti-war. But they are often motivated by a patriotism fueled by adolescent enthusiasm. And let’s face it: boys always love fast, shiny machines. The two concepts merged smoothly. The giant robots were soon moved into space, where they were less constrained by gravity. That led to their being based on space stations, which involved more shiny machines. The teenaged boys were happy. But what about the girls? Girls read manga and watched TV, too. Something had to be done to keep their 50% of the market share engaged. In 1991, a manga called Sailor Moon appeared (originally titled Pretty Soldier Sailor Moon) and in 1992 it generated an animé which ran until 1997. It was accompanied by short films, feature films and television specials. Sailor Moon was not the first magical girl. 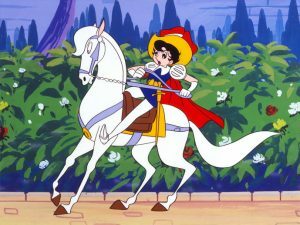 That would be Princess Knight (also derived from a manga) which aired in the 1967. Princess Knight was laid in a typical medieval fantasy setting and chronicled the adventures of Princess Sapphire, who was forced from her earliest childhood to pose as a boy so that her father’s throne would not pass to an unworthy nephew. ‘Prince’ Sapphire is accompanied by a plucky and diminutive angel-in-training named Tink. Sapphire was technically the first magical girl manga. 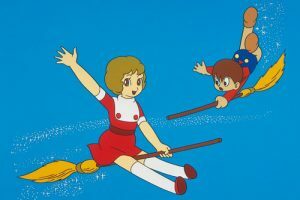 The first magical girl animé would be Sally the Witch who appeared on the screen in 1966. Sally is a typical little girl in the Magic Kingdom, but she yearns to visit the ‘midworld’, Earth. And once she contrives to visit, she decides to stay. While she is here, she tries (not always successfully) to hide her magical powers. But these are forerunners. In Princess Knight, Sapphire never questions the status quo of male superiority. She is what she is, because her father has not real use for a daughter, he needs a son. Sally had magic in her own right, but she was a little girl. She just wanted to live happily and play with her little friends. Such action as was imposed on her was incidental. Sailor Moon transformed the concept of the magical girl. She was not just a girl who had some magic. She was herself magical, imbued with powers because she was innately special. She never had to hide her gender like Sapphire, or her powers, like Sally. She faced trials with courage and pursued goals with determination, as indomitable as any boy. And she was pretty! It was part of her heroic nature that she was pretty. 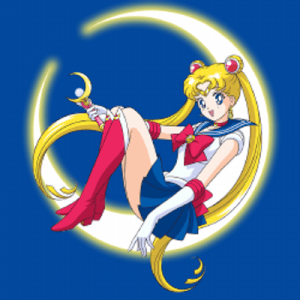 It has been argued that Sailor Moon emerged out of the changing gender roles of Women’s Liberation. That’s quite possible. Others say that the show is all about helping girls through the frightening transition into womanhood. I can see that, too. She transforms in a blink of magic from a cute kid to a beautiful warrior. Either way, she’s certainly an enormously empowering figure for a young girl. I have to confess, she was after my time. I was in college when she got to America, and no longer watching ‘cartoons’. So I don’t always ‘get it’. But I know young women who have assured me that Sailor Moon was life-changing for them. She was followed, of course, by many Magical Girls, none of which dethroned her from her place in the animé canon. She is still royalty, and even if you don’t really want to watch her yourself, you would do well to present her to your ten year old daughter or granddaughter. Like most things in life, animé tropes are not fixed. They evolve and mutate. Fans grow bored with the same thing over and over, and so they change it, dissect it and reinvent it. The more pervasive an individual trope is, the more you can count on a counter-trope appearing to contradict it. Again, let’s start with Mecha. For many years, the planes, star fighters and giant robots were piloted by young boys. Perhaps it was assumed that young boys have sharper reflexes and a greater willingness to take risks then adult men. Perhaps it was simply the Japanese fascination with high school students, or their romanticized concept of youth. But there it was. They’re called Boy Pilots for a reason. And these Boy Pilots were usually comfortable with what they did. Some might be serious but committed, others might be laughing and happy-go-lucky, but they were all volunteers. Then in 1995, Neon Genesis Evangelion was launched. It came as a surprise to everyone, since it was not based on a manga. It turned Boy Pilots upside down. In this story, the earth has been (inexplicably) overrun by a race of giant monsters. They are so well-armored that they are almost impossible to fight. 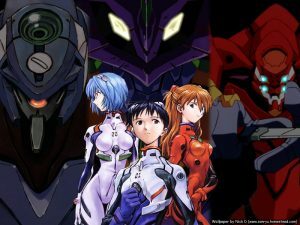 Only one effective weapon against them has been found: the EVA, or Evangelion. These are—surprise—giant robots, machines biologically linked to the nervous systems of their pilots. And for some reason (never given) adults cannot operate them. The pilots MUST be children (girls or boys—the gender doesn’t matter). Just because they are children, does not mean they do not take damage in battle. Many come back from their encounters seriously injured. And yet, there are so few pilots that they must go out again, injured or not. Many of them are not volunteers, and almost all of them are emotionally damaged—from the pressure, from the abandonment by the adults that put them there, from the inhuman linkage and the carnage in which they must participate. This is a dark and disturbing tale. It may be about children, but it is not for children. It takes more than one TV series (even one that generated numerous follow-up shows) to destroy a literary archetype. There are still many Boy Pilots and numerous Mecha. 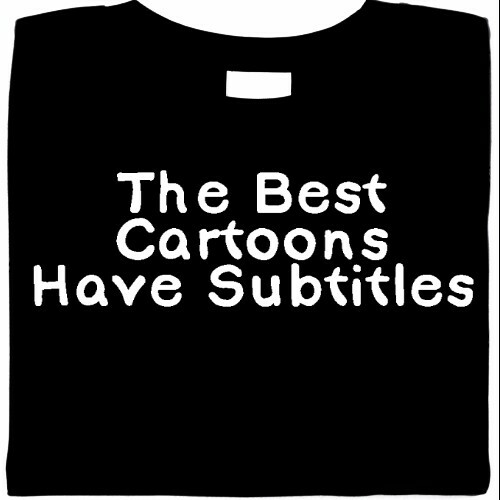 We couldn’t have animé without them. But they are handled a lot more carefully now. Technically I’m talking out of turn. Puella Magi Madoka Magica is not from the 90’s. 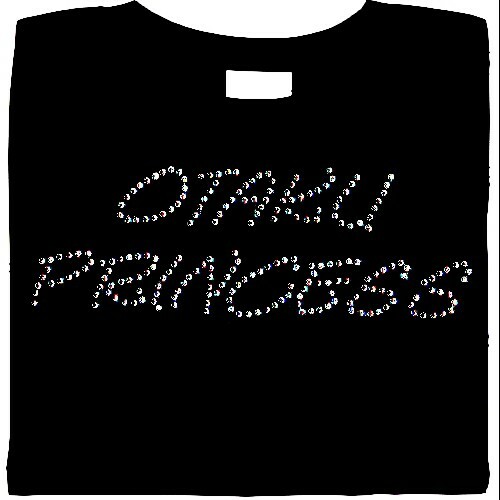 It debuted in 2011 (and was not preceded by a manga.) But it is aimed point-blank at Sailor Moon. You won’t realize that immediately. For starters, it looks like a typical Magical Girl story. The animation is more sophisticated than the counterparts from the ’90’s, but the emotional thrust is the same: adorable little girls in poufy dresses with armloads of hair. And talking kitties. Everybody loves talking kitties, right? In the first episode, the story proceeds along traditional lines. 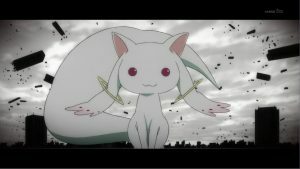 The cute little talking cat offers Madoka and a few of her friends the chance to become Magical Girls. The girls are warned that being a Magical Girl is not just pretty dresses and magic powers. The role carries a responsibility to assist in the fight against evil witches. Since the contract is so serious, candidates are offered a ‘signing bonus’. i.e. a magic wish—for anything at all—in advance. 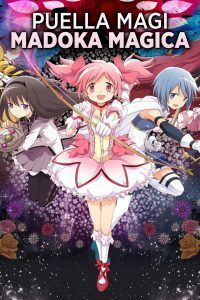 One of Madoka’s friends snaps up the chance immediately, but Madoka chooses to think carefully about both the contract and the possible wishes. She’s invited along on a witch hunt, and she meets some veterans who are not happy with their choice. She learns the work is dangerous, in many ways, on many levels. She learns the cute little kitty has been far from honest with her. She travels into some very dark places and discovers things she cannot in good conscience walk away from. She reaches a point of no return, and her final choice is so heartbreaking it will leave you in tears. There is a reason why this show won so many awards. Again, one beautiful, powerful story cannot destroy the archetype it addresses. Animé will always have Magical Girls. They serve a purpose in the canon. 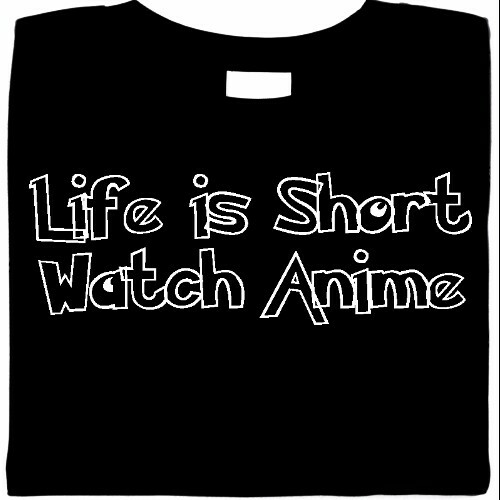 But thanks to Puella Magi Madoka Magica we take them with a grain of salt. More Anime On Buzzy Mag! The Other Side of East - Find out what anime is really about and where it actually came from – you may be surprised. If you think it’s weird, read this and find out why it’s worth a try. The Other Side of East Back to the Past! Enjoyed This Post - Read More Michaele Jordan! Michaele Jordan was born in Los Angeles, bred in the Midwest, educated in Liberal Arts at Bard College and in computers at Southern Ohio College. She has worked at a kennel and a Hebrew School and AT&T. She’s a bit odd. Now she writes, supervised by a long-suffering husband and a couple of domineering cats. Her credits include a recent novel published by Pyr Books, Mirror Maze, and a previous novel serialized in Jim Baen’s Universe, Blade Light. 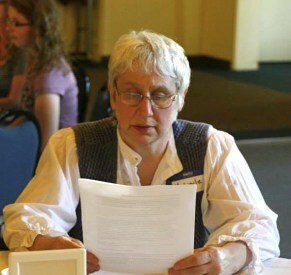 She has numerous short stories floating around the ether—including The Once and Future Cake and We’re All Super Here right here in Buzzy Mag. Horror fans might also enjoy her Blossom series in The Crimson Pact anthologies. For more detail, she cordially invites you to visit her website, MichaeleJordan.com while waiting for her upcoming steam-punk adventure, Jocasta and the Indians.